Drain Cleaning Napa, CA | A+ Waterworks, Inc. It is important to regularly conduct pipe maintenance and drain cleaning in Napa, CA. Pipes and drainage systems are consistently exposed to sewage and debris of food, organic products, soap, and even hair. Signs That It Is Time for Professional Drain Cleaning—Napa, California Residents, Take Note! Slow drains call for professional drain cleaning in Napa, CA. The buildup of grease and other elements blocks the pipelines. If not addressed immediately, this may lead to an emergency mess and unnecessary expenses. Frequent clogs are an indication that you need to call for drain cleaning in Napa, CA. When a drain malfunctions repeatedly, it is a warning that there are still remnants of the blockage within the pipelines. It is best to call professional drain cleaning companies because they have the specialized services needed to get rid of all the debris. Also, their technicians are well-trained in drain cleaning in Napa, CA and will ensure that no blockage will be left in your pipelines. Multiple clogs? Do not delay drain cleaning in Napa, CA. Do your toilet, sink, and bathtub seem to be clogged? Multiple fixtures getting affected at the same time can be an indication that there is a blockage in the pipe’s main line that can only be resolved by professional drain cleaning in Napa, CA. Unpleasant odors? Let experts in drain cleaning in Napa, California get into the root of the problem. One important way of maintaining your Napa, California home is through professional drain cleaning and plumbing. Napa, California residents have trusted A+ Waterworks for more than 20 years. We are a locally owned sanitation services provider that attends to the plumbing and sanitation needs, including drain cleaning, of Napa, CA residents. Because we understand the urgency for plumbing and drain cleaning for Napa, CA households, we are open for service 24 hours, seven days a week. Why Should You Let a Professional Do Your Drain Cleaning? Napa, CA Locals, Take Note! Professionals execute drain cleaning in Napa, CA while prioritizing service efficiency. The cleaning products available in stores are composed of chemicals that are not completely soluble. Hence, they add to the debris that clogs your pipes. On the other hand, professional drain cleaning in Napa, CA uses efficient methods. A+ Waterworks ensures that pipes are free from buildup after we execute drain cleaning in Napa, CA households and properties. 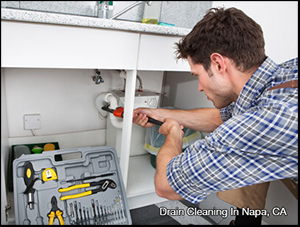 Entrusting your drain cleaning in Napa, CA to professionals will aid with your system’s longevity. Regular drain cleaning of pipes with the help of a professional will make your plumbing system last longer. Thus, drain cleaning in Napa, CA essentially equates to savings, as you will reduce your chances of costly plumbing emergencies. A well-established company like A+ Waterworks provides high-quality drain cleaning in Napa, CA and other services. At A+ Waterworks, our technicians who perform drain cleaning in Napa, CA are equipped with years of training and experience. They are skilled in providing drain cleaning in Napa, CA for pipes of all sizes, be it in residential or industrial spaces. Drain cleaning in Napa, CA needs the effectiveness carried out by professionals. Many home and business owners rely on our skilled technicians. You can also be confident that we have the right tools and equipment to maximize drain cleaning of Napa, CA properties. We will efficiently do the drain cleaning in Napa, CA for you. A+ Waterworks is a locally owned and operated plumbing, fire system installation, and sanitation service company. We treat every client like they’re family and do everything we can to understand their situation. At the core of our multiple services is empathy and passion. After learning about the importance of our services, it’s time to get in touch! We serve all residential and industrial clients in North Bay, CA.